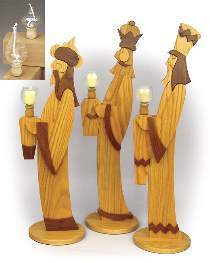 The Three Kings are all made from 3/4" oak with 1/4" walnut and oak overlays. We recommend you purchase all the required 3/4" stock at your local source. The hard to find 1/4" oak and walnut overlay stock can be ordered below. Plans drawn FULL SIZE. Tallest king measures 33"H. The Three Kings can hold either your own tapered candles, our glass votive candle holders (as pictured) or for a dramatic look, glass oil candles. Order one #1079 Candle Parts Hardware kit (which includes 3 oak candle cups, 3 brass inserts, 2 oval glass candles and 1 teardrop glass candle), five #1319 and one #1423. Or save with the #1182 Special which includes the plan, hardware kit and hardwood.